Epic Ireland is a trading name of Epic Adventures Ltd Limited having its registered office at Barnaderg, Tuam, Co. Galway, Ireland and which is incorporated in Ireland with limited liability. Company registration number 533992. The ‘client’ is the person or persons who has/have made a confirmed booking with Epic Ireland. Your statutory rights are not affected by the within Terms and Conditions. A booking is accepted by Epic Ireland, only when we, or our agent have either received a 30% deposit and confirmed your booking by email if your booking is made more than 30 days in advance of your tour departure or when we have received payment in full and confirmed your booking by email if your booking is made less than 30 days before your tour departure. No tickets will be issued until full payment has been received. On receipt of payment as detailed above, subject to availability and at our discretion, Epic Ireland will reserve the client a place on a trip. A contract is only made between the client and Epic Ireland upon the confirmation of your booking and our communication thereof to either you or our travel agent. It is a condition of your booking being accepted that each client signs (or has signed on his behalf if under 18) our waiver of liability, a copy of which will be forwarded to you on booking and which must be signed and presented to your Epic Ireland Representative at the commencement of your tour. Failure to sign a waiver will result in the client’s booking being treated as having been cancelled by you and we reserve the right to impose the cancellation fees described in this agreement. The price of your ticket does not cover your travel insurance. Epic Ireland strongly recommends that the client purchases comprehensive travel insurance cover for cancellation, medical expenses, personal accident, personal luggage, money and public liability before you travel. The client should ensure that any activities undertaken by the client during the Tour are covered by their insurance, in this regard, please note that certain activities may require specific insurance and it is a matter for the client to ascertain the position with their insurer before partaking in any activity. Epic Ireland reserves the right to refuse admission to a passenger unless the client has arranged appropriate insurance. Epic Ireland accepts no responsibility for loss or personal damage to personal belongings or liability for personal injury/death. Cancellation of a client’s booking must be notified in writing to Epic Ireland. Cancellation charges are calculated on the day when written notification is received by Epic Ireland. The Table below shows the number of days before departure dates that Epic Ireland receives written confirmation of cancellation, and the percentage of tour fare, including any surcharges that will be imposed on the client as a corresponding cancellation charge. Please note that in addition to the tour fare cancellation charges set out below, the client may also incur cancellation fees in respect of any third party suppliers booked by the client in association with an Epic Ireland Tour. Once the tour has started, no refunds will be made under any circumstances for any unused sectors or sections. If the reason for the client’s cancellation is covered by the client’s insurance policy, the client may be able to make a claim under that policy, this is entirely a matter between the client and their insurer. If the client wishes to change to an alternative departure date, this must be done with a minimum of 7 days’ notice. One change of date is allowed free of any charge by Epic Ireland; any subsequent changes will be subject to a €40 administration fee. Any charges or non-refundable deposits which have been paid to third party suppliers are payable by the client in these circumstances. Any increase in price will be notified to Epic Ireland agents, and on our website. Epic Ireland will endeavour to remove all out of date promotional material. Epic Ireland reserves the right to reduce the price of any of our tours. The final price applicable will be confirmed to the client before the client makes a booking. Epic Ireland itineraries are deliberately flexible and if possible the requirements of individual groups and clients will be facilitated. Epic Ireland reserves the right to vary, modify or cancel any itinerary, either partly or wholly. Itineraries published are sample itineraries only and may be amended without notice. Epic Ireland also reserves the right to use alternative vehicles to those advertised in the brochure. In the event of cancellation of a tour by Epic Ireland, Epic Ireland will offer a full refund of the tour price only, less any non-refundable elements, or alternative travel arrangements to all clients booked onto the tour. In these circumstances, no incidental or consequential expenses will be paid by Epic Ireland. If access to any country or area is prohibited for reasons beyond Epic Ireland’s control the client will be entitled to a refund only if Epic Ireland cannot offer substitute services of an equivalent standard. The amount of the refund will be calculated pro-rata based on the total number of tour days and the number of tour days already travelled. Tickets can only be used by the client to whom the ticket was issued; no other person can use the ticket in any circumstances. The ticket must be produced at any time at the request of an Epic Ireland Representative, and the client may also be asked to produce valid photo identification. The client must observe the laws and regulations of the countries visited, including customs and foreign exchange restrictions. If the client does not, they may be asked to surrender their Epic Ireland ticket which may be cancelled without refund. In the interest of safety there may be times when the Epic Ireland representative has to make a decision. It is a condition of booking that the client must comply with the authority and decisions of the appointed Epic Ireland representative. If the client does not comply with the Epic Ireland representative and is not compatible with the general enjoyment and wellbeing of the other members of the tour, Epic Ireland reserves the right to exclude the client from continuing the tour. In such a case, Epic Ireland will not be liable for any refund, compensation or any additional costs incurred by the client. Epic Ireland cannot accept responsibility for the behaviour of others on tour or for any activities that are curtailed as a result. Our Epic Ireland tours are physically active, with varying levels of demands and fitness requirements depending on the specific itinerary and duration of the tour. By booking your tour you represent that you do not have any physical or other conditions that would create a hazard for you or other Participants or affect other people’s enjoyment of the tour. If you have a physical or medical condition, dietary restriction, or other condition that will require special attention during the tour, you must inform us in writing when the booking is made. We may require a medical certificate if you have a special condition. We reserve the right in our sole discretion to accept, decline, or remove anyone from a tour (at departure or during the tour) who we judge to be incapable of meeting the tour’s physical demands. You must complete a waiver as detailed above before commencement of the tour confirming your understanding of these circumstances and confirming your physical and medical condition. Please be aware in this regard that participation in each individual activity is a matter for the client on a day to day basis during the tour. If you do not want to participate in a particular activity, please let the Epic Ireland Representative know. Epic Ireland assumes no responsibility for any medical care provided to you. You agree to assume all costs of medical care and related transportation that are provided to you during the tour. The client is responsible for all travel arrangements and costs to/from the point of commencement/conclusion of the tour. It is the responsibility of the client to ensure they have a valid passport and all visas, permits and certificates required for your selected tour, as well as any vaccinations and to comply with all applicable laws. The client agrees that Epic Ireland may take photographs and films of the client while on the tour and that these may be used in Epic Ireland brochures and/or advertising without obtaining further consent or payment in respect of such photographs or films. Should the client have a complaint in respect of the tour, they should inform the Epic Ireland representative during the course of the tour. If the matter cannot be resolved after the representative’s best endeavours to do so during the tour, the client’s complaint should be made in writing within 28 days thereof so that it can be investigated. Any claims made after the 28 days period will not be considered by Epic Ireland. If the client chooses to write to Epic Ireland via the Internet, please include a home address to reply to in writing. Please note that if you attempt to address a situation on your own without using this notice procedure, you assume responsibility for any added costs you may incur and forfeit any potential refunds. The contract and all matters arising in respect hereof shall be subject to Irish law and the jurisdiction of the Irish Courts, unless we agree otherwise in writing. If any provision of these terms and conditions is held invalid or unenforceable by any court of competent jurisdiction, that provision shall be deemed to be re-written to give effect to the same purpose within the permitted limits of the law. The validity and enforceability of the other provisions shall not be affected. If the client is unsuccessful in any legal action instituted against us, the client agrees to pay all our costs, including, but not limited to, legal costs. Clients must be aged 18 years and over but Epic Ireland may, at its absolute discretion, and in exceptional circumstances, give confirmation of acceptance of a person outside this age restriction, subject to the signing of a waiver on behalf of the client by a parent or guardian and any other conditions that Epic Ireland my deem appropriate. You agree that the sole remedy for any default by Epic Ireland arising under this agreement shall be the return of the paid tour cost. To the maximum extent permitted under applicable law, Epic Ireland shall not be liable for any special, consequential, indirect, incidental or other damages arising out of or in any way connected to this agreement, including lost profits, whether such damages arise in contract, negligence, tort, under statute, in equity, at law or otherwise, even if Epic Ireland has been advised of the possibility of such damages. You expressly waive any right you may have to recover such damages. 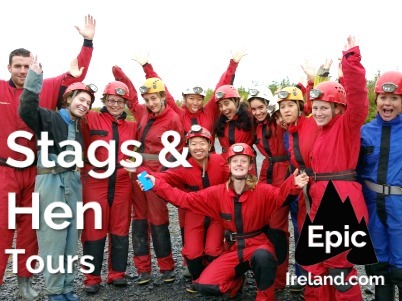 The client accepts that certain activities and aspects of Epic Adventures Ltd are weather dependent and that under no circumstances can Epic Ireland be held responsible for weather conditions. Epic Ireland will not be deemed in breach of these terms and conditions or otherwise liable to you, by reason of delay in performance or non-performance of any of its obligations under these terms and conditions to the extent that any such delay or non-performance is due to any Force Majeure. “Force Majeure” means any circumstances beyond the reasonable control of Epic Ireland, including without limitation acts of God, terrorist activities, insurrection, explosion, flood, tempest, forceful wind, fire or accident, war or threat of war declared or undeclared, sabotage, civil disturbance, labour strikes, requisition, sickness, quarantine, government intervention, weather conditions, volcanic ash clouds and unforeseen circumstances. If Epic Ireland and/or any of its Suppliers are affected by Force Majeure, they shall be entitled to, and may in their sole discretion, vary or cancel any itinerary or arrangement in relation to the tour. Regarding civil unrest, once Epic Ireland has investigated the prevailing situation, as it deems fit, it shall remain in Epic Ireland’s sole and absolute discretion whether to commence or proceed with a tour. In the event that a tour has to be cancelled due to Force Majeure then the client will be offered an alternative tour at no extra cost. If this is not possible then the cancellation policy at paragraph 3 above will be applied. Epic Ireland operates a no-smoking policy on all its vehicles. The booking conditions detailed herein together with the Waiver of Liability contain the entire contract between the client and Epic Ireland. No representation, term, warranty or condition can be expressed or implied by reference to any other writing, advertisement or conversation. This contract may only be varied in writing by a duly authorised Director of Epic Ireland. 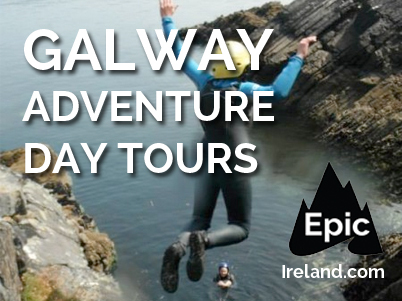 The client’s contract is with Epic Ireland as the tour operating company. At any time and at Epic Ireland’s discretion, we may nominate to the client in writing any other company or person to have the benefit of some or all of those provisions of this contract, which Epic Ireland may then specify, as if the client had agreed the provisions directly with that company or person in the first place as well as agreeing them with Epic Ireland. Epic Ireland may, at its complete discretion assign all or any rights and liabilities arising under or by virtue of this or any other contract with the client. All bookings with carriers and other service providers (including but not limited to providers of accommodation, activities and food) are subject to the terms and conditions and limitations of liability imposed by those carriers and other service providers. Please note that some of these limit or exclude liability in respect of death, personal injury, delay and loss or damage to baggage. Whilst Epic Ireland cannot accept any responsibility for any loss as a result of such actions or as a result of any act of omission of any such third parties, Epic Ireland will give assistance to the client in helping to resolve any reasonable dispute. Many accommodation arrangements referred to in the brochure are provided independently by third party accommodation providers. Such arrangements are subject to the terms and conditions and limitations of liability imposed by those providers, and as such any contracts are undertaken directly between you and the third party accommodation provider. All such arrangements are made independently of Epic Ireland, regardless of any help and assistance which Epic Ireland may provide in securing such arrangements. Many activity and outdoor pursuits arrangements referred to in the brochure are provided independently by third party activity and outdoor pursuits providers. Such arrangements are subject to the terms and conditions and limitations of liability imposed by those providers, and as such any contracts are undertaken directly between you and the third party activity and outdoor pursuit’s provider. All such arrangements are made independently of Epic Ireland, regardless of any help and assistance which Epic Ireland may provide in securing such arrangements. Please note that no airline, carrier or third party service provider depicted or recommended in the brochure, by virtue of their endorsement of this brochure, represents themselves either as contracting with or having any legal relationship with Epic Ireland. Every effort is made to ensure brochure accuracy at the time of going to print, however Epic Ireland cannot be held responsible for printing and typographical errors, or errors arising from unforeseen circumstances. Updating of Terms and Conditions: Epic Adventures Ltd Limited reserves the right to update and/or alter these terms and conditions at any time. It is your responsibility to be familiar with these terms and conditions.